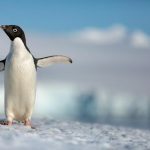 UPDATE – 10/10/2018 – The fourth hotel has been officially canceled. Now we wait to see what The Disneyland Resort has planned for the west end of Downtown Disney. You may remember several shops closed in anticipation of this new hotel, including ESPN Zone, Rainforest Cafe, and AMC theaters. Earl of Sandwich has recently reopened. 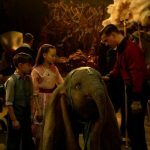 What are your thoughts on the cancellation of the fourth hotel? The Disneyland Resort really needs a fourth hotel, especially with the Star Wars Land expansion, so I’m looking forward to hearing their new plans in the future. Yesterday Disney finally announced the plans for its long-awaited fourth hotel. 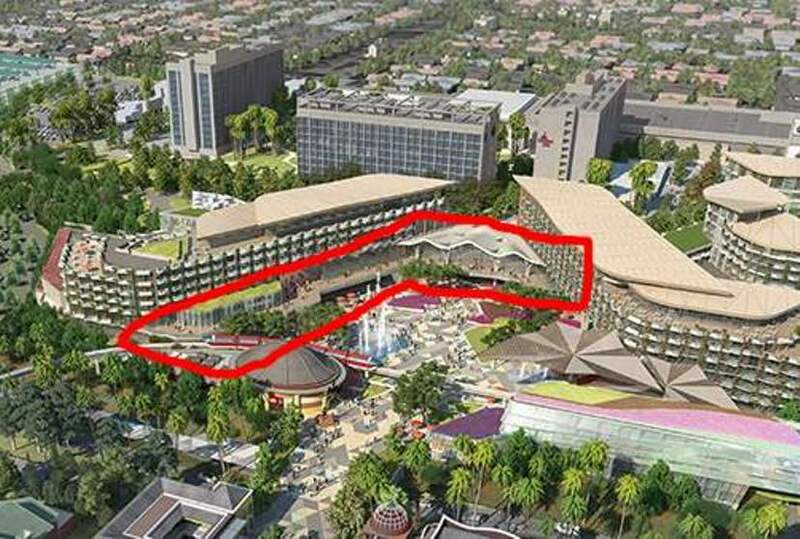 After years of rumors and potential locations, we now know for sure the hotel will be built between The Disneyland Hotel and Downtown Disney. This news came as a bit of a shock to some, since this area is already occupied by popular dining establishments and a movie theater. But these buildings will soon make way for a new luxury 700-room hotel and retail space, and will once again connect the Disneyland Monorail to a Disneyland hotel (if you’re old like me, you’ll remember the grounds of The Disneyland Hotel used to extend aaaaaaaall the way to the current Downtown Disney Monorail station). Last night I studied the hotel concept art like the Zapruder film and noted a few things. 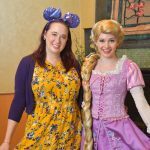 Here are my thoughts and speculation on the new hotel. 1. The Disneyland Resort has high demand and limited space. If only Walt could have predicted just how wildly popular his park would become, perhaps he would have purchased more than 160 acres of orange groves. But since we can’t go back in time, Disneyland is gonna have to work with what they got. Disneyland is nothing like Walt Disney World, where they have the space to expand, expand, expand. Disneyland has to build up. The three towers of The Disneyland Hotel are 13 stories each. Based on the concept art, the new hotel – which will be built right next to The Disneyland Hotel – will be comprised of four buildings reaching maybe 7 or 8 stories. I’m happy they aren’t putting a high rise right in the middle of the Resort property, but I question the decision to build lower buildings over such a wide spread area. 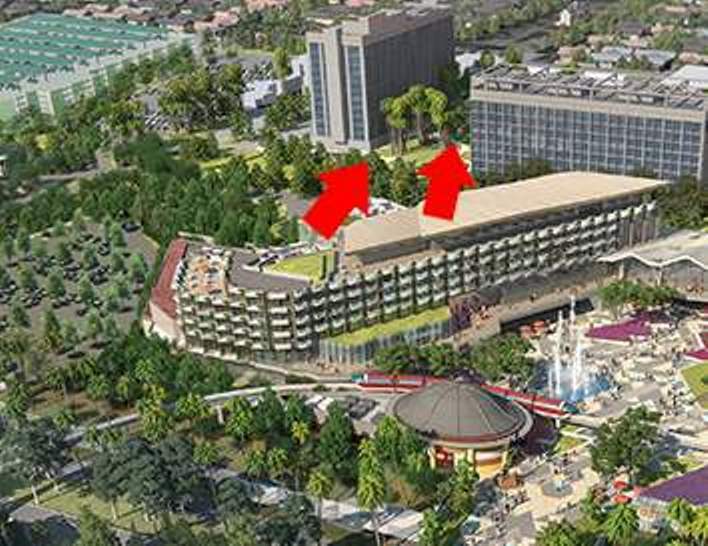 The initial plan (or rumor) was a high rise hotel in the area of the current Downtown Disney parking lot, which I think I would have preferred. However, my architecture experience is very limited (aka non-existent) so nobody consulted with me. 2. ESPN Zone, Rainforest Cafe, AMC, Earl of Sandwich, and Starbucks are gone. I can imagine some of these establishments will be relocated inside the new hotel. Starbucks and Earl seem like shoe-ins. But get in your final visits to ESPN and Rainforest because I don’t think they are coming back. As for the AMC … I have seen several movies there, especially when it first opened, and I’ve NEVER seen it crowded. I think it has been hemorrhaging money for years. 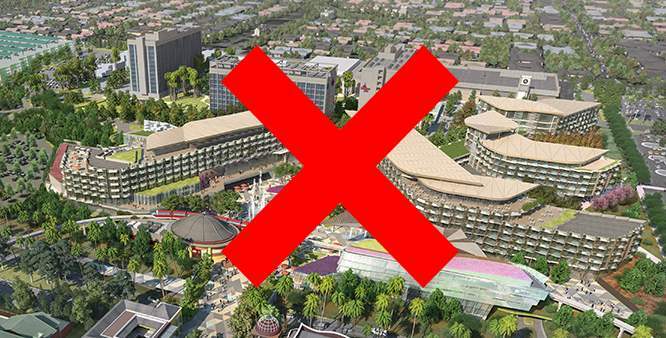 Generally tourists aren’t coming to Disneyland to watch movies. 3. The design seems very contemporary and bland. 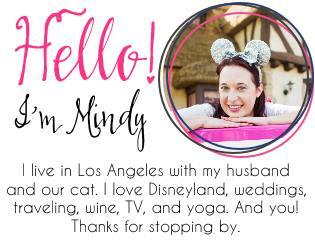 Wedged between the rustic charm of Disney’s Grand Californian Hotel and the whimsical magic of The Disneyland Hotel, Disneyland Hotel #4 seems a little … blah. Even though we’re promised the hotel will “showcase nature on every level,” the concept art seems a little stark. It reminds me a bit of FutureWorld at Epcot, which is an area I never really want to hang out in. I can’t wait to read over this article in four years and hopefully see how wrong I was. 4. Ground traffic will be moving up. 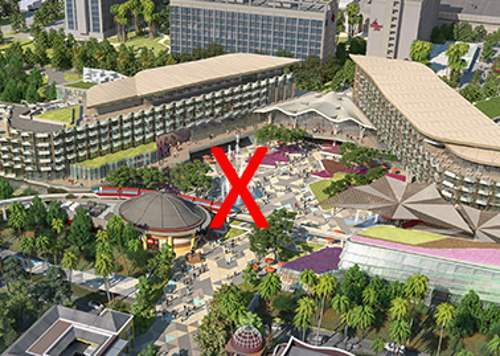 Based on the concept art it appears there are walkways and terraces along the second level of the hotel, which will hopefully help with the congestion of this packed area. 5. I spy rooftop patios. 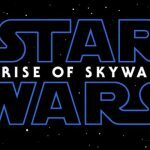 I hope this means rooftop restaurants and lounges offering awesome views of the Resort. And I hope they are open to everyone, not just hotel guests. And I hope they don’t have a crazy $20 cover charge to get in. And I hope there are some rooftop wedding venues as well. 6. 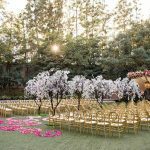 Some of the hotel rooms might have a view of the Rose Court Garden. And that’s pretty fun. 7. What about the pool? One thing that’s not clear on the concept art is a pool area. I’m sure they will have one, but where will it be? The orange dots on the south side of the buildings make me think “pool umbrellas.” A rooftop pool would be cool, but again it’s not specified on the map and also one would think the pool would be in a more centralized location. But anyway, based on the art my guess would be over on the south side, or between the two buildings on the north side. 8. The Simba Lot is turning into a structure. The art clearly shows a parking structure in the area of the Simba lot, south of the Frontier Tower. It sounds like this will be the parking area for Downtown Disney, which seems like a hike. Perhaps they will put in some kind of above ground pedestrian bridge to accomodate visitors and to keep the hotel areas from getting too crowded with foot traffic. 9. I predict that water feature won’t last long. That area is going to be very, very, very crowded. Water features are nice, but … let’s learn from the Tomorrowland water feature fiasco and just cut it from the design now. 10. 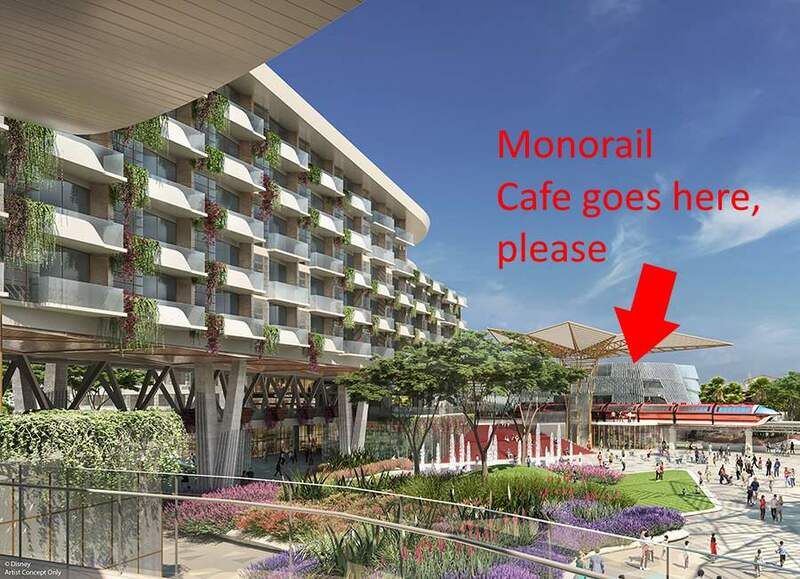 I would love to see the return of The Monorail Cafe. Please? 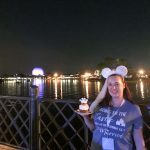 It was my favorite spot to grab some food and a delicious milkshake, and it’s pretty much the only thing I miss from the “old” Disneyland Hotel. I’d love to see it make a comeback. One thing is for certain: We are going to be experiencing some major changes and growing pains. How do you feel about the new hotel plans? Are you excited about the changes, or feeling nervous? I would like to see more concept art. I agree that I wasn’t overly impressed with what I saw. Disney can do such amazing themeing, so if they’re building a new hotel they definitely need to bring it there!